After 18 holes on the Florida course, McIlroy said of his playing partner: "He probably shot around 80. He's a decent player for a guy in his 70s." In the post, he said he respects Mr Trump's office and hit out at those who described him as a fascist and a bigot in the wake of the meeting. 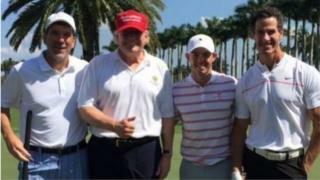 "I don't agree with everything my friends or family say or do, but I still play golf with them," he tweeted. "Last week, I was invited to play golf with the president of the United States. Whether you respect the person who holds the position or not, you respect the office that he holds." He added that the game was "not an endorsement, nor a political statement of any kind". "It was, quite simply, a round of golf," he wrote. "I've travelled all over the world and have been fortunate enough to befriend people from many different countries, beliefs and cultures. "To be called a fascist and a bigot by some people because I spent time in someone's company is just ridiculous. I hope, to some degree, this clarifies my decision to accept the invitation."